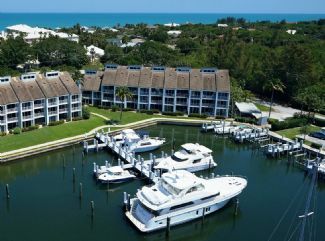 Beautiful deepwater slip in private, Spyglass Harbor Marina in the Moorings Yacht & Country Club community. #37. Large 17'10" wide ready for up to a 60' yacht. Channel entrance at ICW MM #957. 8’ depths and no fixed bridges. Midway between town of Vero Beach and Ft. Pierce Inlet. Totally refurbished docks (10/16) w/wood encapsulated concrete pilings. New power pedestal and dock box. $550/mon. plus metered 30/50 amp electric. 6 mon. minimum term. Owner between boats. Private, secure & sheltered with straight-in, easy access. Spyglass Harbor is known for its protected-port characteristics during storms. See Image- Slip is 3rd in from 95' Ocean Alexander stern on North side. No liveaboards permitted in Spyglass Harbor.